In 2001, Antoine Fuqua directed Training Day. The film would earn Ethan Hawke an Oscar nomination and Denzel Washington a Best Actor win. Since then, Fuqua has been struggling to produce another hit. Tears of the Sun, King Arthur, Shooter, Olympus Has Fallen, The Equalizer; all action, all gritty, all received with the same lukewarm sentiments, but none living up to the standard he inadvertently set for himself fourteen years ago. What may have been missing all those years was a film with dark realism, a plot that audiences could believe and support, a human story that meant something more than gunshots, speaking to us in the raw language we enjoy hearing even when it frightens us a bit. And, oh yeah, Jake Gyllenhaal beating the life out of himself & others as he becomes a tortured Rocky that we can’t help but cheer for. That was missing too, but thankfully it’s all here now. Billy Hope is a boxing champion, a fighter who doesn’t lose, a brawler who actually likes getting hit. His success is unparalleled, as is the hotness of his wife, the excellence of his daughter, the sheer number of his cars, and the rise of his stardom. But it’s all temporary, as the love of his life Mo tries to tell him, warning Billy that he’s taking too many hits, that his “friends” won’t be around forever, and that he needs to start thinking about his future, his family, & his health. Great advice, and perhaps a wonderful path was being prepared, until a terrible tragedy changes everything. Sadly, Maureen dies, and, consequently, Billy loses control. He can’t pay his bills, can’t finish his fights, can’t take care of his daughter, and so loses all the things that were important to him one by one. But don’t count the Champ out quite yet. To get his daughter back from Child Protective Services, Hope will have to get a job, an apartment, clean himself up, and prove that he can battle the demons that follow him into the ring. He did it; Faqua found a hit. 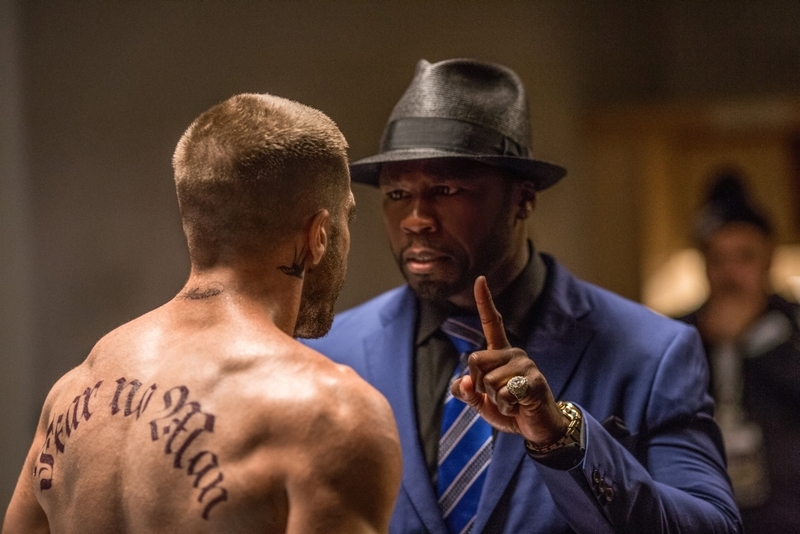 It won’t rival Training Day as a monument to the year it was released, but Southpaw succeeds where other movies have failed because it gives audiences exactly what they want, handing out returns for our emotional investment. The film is a modern Rocky with an Eminem soundtrack, a second The Fighter with extra blood packs, a male version of Million Dollar Baby with a happier ending. It’s the things we want from a riveting sports movie, hold the cheese, and by the end there is only one thing we care about; the triumph of Billy Hope. We become sucked in to a plot that might be standard (a falling star, working hard to return, fighting for his pride) but has all the tools to hook us and keep us in our seats. The music, the pace, the dark times, the obligatory jumping rope; all the classic pieces of a great boxing movie are right here for the watching, all we have to do is open our eyes. That’s not to say that the film is perfect, and for that reason it should be seen as at least a small step below the three other pugilist pictures I mentioned. And perhaps some will rank it even further down, depending on how unforgiving they were feeling at the time. Because there are some parts you’ll definitely need to forgive. 50 Cent, for instance, could not possibly have been worse, from his stupid hat to his silly grin. The boxing commentators’ lines seemed specifically written to sound like every other boxing movie you’ve ever seen. And during a scene where items were being taken out of Billy’s home to pay his debts, you could hear movers in the background explaining that fact; “Put it over there, everything is being sold. Yes, it’s all going to auction.” Thank you, I couldn’t possibly have figured that out by myself. So, the details may not have been perfect, and the concept was definitely not original. But American audiences love this style of film, it feels very comfortable to us, and as long as you allow yourself to jump on board, you’re in for a treat. And, oh yeah, Jake Gyllenhaal. His turn-around from Nightcrawler to this, his dedication to getting it right, the way he left everything in the ring, his ability to make us forget his Hollywood Hunk status; he carried this film in his very muscular arms, held it up when it got shaky, and set it down gift-wrapped in our laps. If not quite an instant classic, Southpaw at least wins.